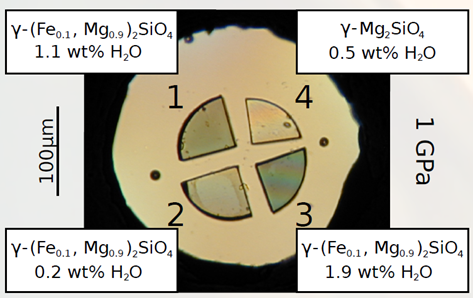 Kirsten’s work on the possibilities to use tailored single-crystal samples in the pressure chamber of a diamond-anvil cell has been published online. The paper entitled „Multi-sample loading technique for comparative physical property measurements in the diamond-anvil cell“ can be found here. GeoMaX group members co-author a recently published paper on the synthesis and properties of „transparent polycrystalline cubic silicon nitride“. The article is published online in Nature Scientific Reports and can be found here. The work of GeoMaX postdoc Alexander on the high-pressure elasticity of single-crystal bridgmanite has been published online in Nature today (link). Bridgmanite is the most abundant mineral in our planet and knowledge of its elastic behavior is needed to interpret seismological observations and link them to the structure, composition and dynamics of Earth’s interior. Our paper reports on the first experimental determination of the elastic tensor and sound wave velocities of (Al,Fe)-bearing bridgmanite at pressures of Earth’s lower mantle. In the work published today, we compare models based on our experimental results to seismic observations and thereby constrain the average composition of the shallow lower mantle. We find that a mantle of pyrolitic composition is consistent with seismic observations if bridgmanite contains ferric iron (Fe3+). We further find that depth-dependent changes of the ferric iron content may occur in bridgmanite. This novel finding opens the possibility for related variations in physical and chemical properties of the lower mantle with depth that need to be determined in future studies.